Imagine an Era of Solar Powered Air Conditioning Units! Air conditioning units are a must-have for every homeowner particularly those living within the tropics. This is because the cooling required particularly during summer can’t be effectively provided in any other way. However, the major drawback homeowners face whenever they consider AC units is the financial burden associated with energy bills required to run the system. Thanks to innovation, a relief could be along the way. Research has ventured into the use of solar energy to run AC units. And because this is free natural energy, AC units of the future are likely to be run in a much cleaner and more efficient way. All homeowners will need is to put solar electric panels on their rooftops, capture as much solar energy as possible, convert it to electricity and use it to run your AC system. However, the catch when it comes to solar energy is how much your solar panels can capture versus the needs of your AC system. As it is today, you will require a lot of solar photovoltaic panels to generate sufficient power to run an AC system. In order to overcome the cost dilemma associated with cooling your house using solar electricity, you can do the following. Home energy efficiency upgrades – This will reduce the amount of heat leaking into your home during hot weather. Installing energy efficient AC units – Modern AC units tend to be energy efficient which means they do not consume as much power as their older counterparts. This will in turn mean that the amount you are to spend on your solar electric system will not be as much. 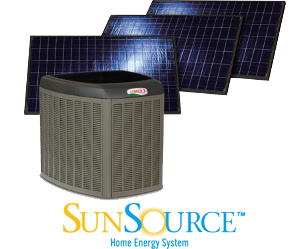 The best approach is to find air conditioning units designed specifically for solar power compatibility. This will be cheaper and more cost effective than running the conventional AC using solar panels. Evaporative coolers leverage water evaporation to achieve a cooling effect. These are very effective especially in very dry climates. The good news is that these air conditioning options use about 25% of the electricity consumed by conventional refrigerant-based AC units to achieve the same cooling level. What this implies therefore is that when you combine the evaporative coolers with photovoltaic electrical generation system, you can come up with a more affordable solar powered AC system solution. Solar powered air conditioning is an excellent idea, but can be expensive to install for most homeowners. Another approach through which you can use solar panels but in a much more cost-effective way, is by installing a solar powered gable or attic vent fan. The logic here is that most homes overheat in summer because the attics are not adequately ventilated. When these attics heat up, the heat energy slowly leaks through the ceiling insulation into your indoor space. An attic solar powered fan can ventilate the attic space and help to reduce the cooling load on your house during the summer season. In addition to the above, other technologies around solar powered air conditioning include passive solar cooling, descant-based systems, and absorption-based solar powered AC systems. Brands such as LG and Lennox have already developed solar powered AC solutions. The LG product is known as the eco-friendly solar hybrid air conditioner while Lennox has named its product The Lennox SunSourceTM .